Known throughout Idaho and beyond, Rocky Watson is a Talented Performance Artist, an Exceptional Vocalist, an Accomplished Songwriter, and more! 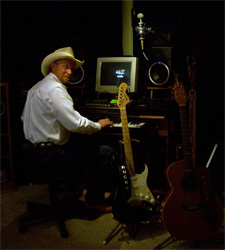 Rocky Watson and Country Music have been a successful team for many years. Rocky is highly regarded for his unique talents as a skillful solo guitarist, an unparalleled vocalist, an original songwriter, a masterful producer, and a supreme entertainer. Rocky has been recognized and awarded on multiple occasions. Rocky's stand out performance earned himself Grand Prize Winner at a past Country Music Showdown competition. At the Showdown, Rocky out performed other talented solo and group artists from around the United States. As a result of the Showdown, Rocky earned a performance on the stage of the world-famous "Grand Ole Opry" in Nashville, TN. He has performed at other famous Nashville establishments including, The "Roy Acuff Theater," and "The Bull Pen Lounge," as well. Rocky has also appeared with several Celebrity Country Music Stars. Rocky continues to perform at many different venues, events, and private parties throughout the calendar year. Notable appearances include the "Pocatello River Festival" held annually in June, and the "Biggest Show in Idaho" Independence Day Celebration, held annually in July. Rocky also performs beyond the borders of Idaho, including shows in Arizona over the course of several weeks. Rocky's entertaining performance includes New Country, Classic Country, Classic Rock of the 50's and 60's, and much of his own work. Rocky was born and raised in Idaho. He and his wife, Patricia, make their home in Pocatello, Idaho, when not traveling to perform. Please use the Contact Us page if you would like to request booking information. © 2005 - 2014, RockyWatson.com, Rowdy Records, Stand Alone Productions. All Rights Reserved.